When we left Paris at the end of Season 7 in Gilmore Girls, she was off to medical school. With the confirmation that Liza Weil is returning to Gilmore Girls for the Netflix revival, Gilmore Girls: Seasons, as is her co-star Danny Strong, portraying Paris’ love interest Doyle McMaster, we know that Paris & Doyle are still together. One of the earliest casting notices for the series involved a Portuguese Nanny named Clementina, who would appear in the second episode of the revival, “Spring.” Paired with the casting notice for the Nanny are two children, Tim (7) and Gabriela (5), both caucasian and appearing in the same episode. Actress Claudia de Vasco recently tweeted her involvement in the Gilmore Girls revival, and by looking at her booking info, we know that she will be playing the role of Clementina, the new Nanny. Claudia is best known for her work on the series Starving in Hollywood. So, let’s connect the dots here. Paris is back. Doyle is back. They are together. There is a Portuguese Nanny. Paris grew up with a Portuguese Nanny. Through inference, the Nanny is for Paris & Doyle’s children. Based on casting notices, we then assume they have 2 children! Squee!! Now, the question is, if Paris is a Doctor, why was she at Chilton?! To Paris, her Nanny (known to us only as “Nanny”) was the most solid and important figure of her childhood. With parents often away, it was Nanny who took care of her. Who loved her. When Paris graduated from Chilton, it was her Nanny and her children who were there for her ceremony, not her own parents. We learned from Paris that Nanny only speaks Portuguese, so Paris herself grew up fluent in Portuguese. In Season 5, we meet Paris’ Nanny (played by actress Soledad St. Hilaire) as she takes care of Doyle when he was sick. As Paris put it so tactfully, “I am taking care of you. I brought you Nanny.” because “sick people make me freak out,” so Paris turned to the person who was always there for her when she was sick: her Nanny. Of course, given that Paris was pre-med, perhaps taking care of people she cared about was the scary part! We welcome the ‘new’ Nanny to Gilmore Girls, it speaks to an exciting chapter of change for Paris & Doyle! 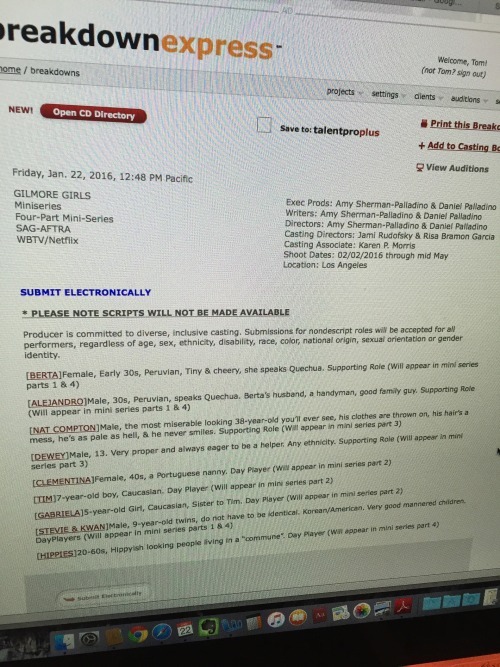 See all the actors and guest stars set to appear in Gilmore Girls here. So, once more the Portuguese Nanny isn’t Portuguese. The Portuguese dialogue will not be credible or make any sense. As much as I love GG this was a good opportunity to fix some of its previous mistakes – doesn’t seem like any of that will happen. First of all the fisrt appearance of Nany is in the season 3 finale, trying to speak what we Latinos call “portunhol” a mix of Spanish and Portuguese the people from South American uses when they don’t know the local language and try to mixing things up turn it all very confusing. But what Nany speak, in both episodes that she apers, is just words that doesn’t make any sense. We, Latinos, know the people from US aren’t able to distinguish one another, but we (people from North – don’t forget Mexico – central and South America) watch theses show too so I guest they could put some more edfort and make lines in the real language that the character is supost to be talking to. I love the show, but those two episodes make me sic. I studied both Spanish and Portuguese at University and could have sworn it was much more Spanish we heard Paris speaking at the start of the series but it switched to Portuguese by the end of Season 3 at the graduation. They really should have had more linguists working with them on this!